The U.S. Department of Education (DOE) released a proposal with sweeping changes to how schools handle sexual misconduct cases Friday, from protecting the rights of the accused to narrowing the definition of sexual harassment. 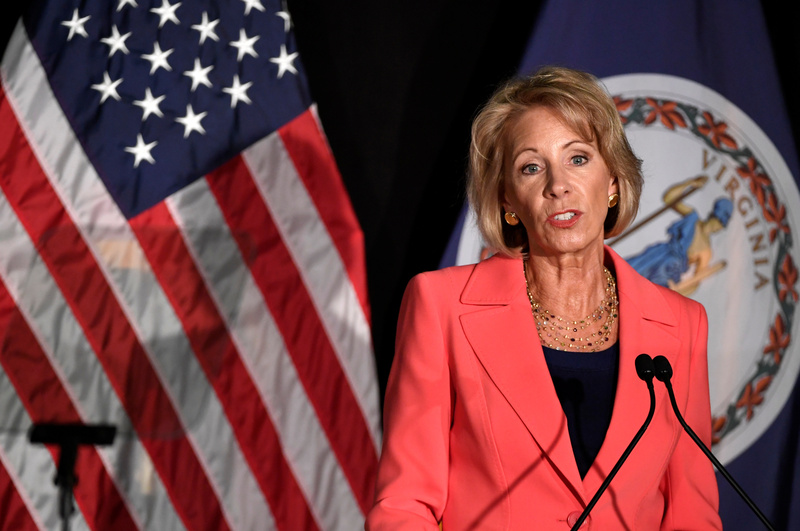 The new proposal aims for students to clearly understand their rights and options, and for schools to understand their legal obligations in regards to Title IX, according to a press statement from the DOE Friday. The federal civil rights law, however, “never addressed sexual harassment or assault, specifically, or the need for due process protections in Title IX grievance processes related to sexual harassment,” according to a DOE backgrounder. Criticisms of Title IX implementation included government regulation of sexual activity that was consensual and having “too wide a range of misconduct” that hindered academic freedom and speech, according to a DOE document. “Far too many students have been forced to go to court to ensure their rights are protected because the Department has not set out legally binding rules that hold schools accountable for responding to allegations of sexual harassment in a supportive, fair manner,” Secretary of Education Betsy DeVos said in the press release. One of the proposed changes clarifies that “sexual harassment” would need to be “so severe, pervasive and objectively offensive that it effectively denies a person equal access to the school’s education program or activities” in order for Title IX to be infringed upon. Another change addresses stronger protections of due process for the accused. Requirements include the “presumption of innocence in the grievance process,” “written notice of allegations and an equal opportunity to review the evidence,” and the equal opportunity to appeal from all parties. The right to cross-examination would also be allowed to check the veracity of the parties and witnesses. Parties would not question each other directly, however. Burden of proof and gathering evidence would be the school’s responsibility, not the parties involved. Decision makers would need to be separate from the Title IX coordinator or the investigator. Title IX coordinators, investigators and decision makers would need to be free of any conflicts of interest and bias against the parties involved as well. The draft also encourages schools to provide support for sexual assault victims. Some of the supportive measures include reassigning dorm rooms, no-contact orders and changing class schedules. There will be a 60-day period for the public to provide comments regarding the proposal. “We will then review those comments and ultimately publish a final set of regulations,” a DOE official told The Daily Caller News Foundation over email.